- 【Defense Zone Support】 Support up to 99 Defense Zone, such as gate, SOS, bedroom, window, balcony, perimeter, water leaking detection etc. Support APP Remote Arm/Disarm, parameter setting and accessory management. - 【Phone Call Function】 Children and seniors at home in emergency, press SOS button of the remote controller, which will trigger all alarms and send SOS calls and messages to other families, so they can get help in time. Support 5 groups preset alarm phone number and 20 seconds help voice recording, if alarm occurs, the host will dial preset number automatically. - 【Network Support】 Support WIFI/GSM/GPRS Intranet Alarm System. Support 2.4G WIFI only, the phone needs to under the same WIFI when first time to set up. Support Different Alarm Channels (APP Push / SMS / Voice monitoring / intrannet center Alarm, to ensure the alarm performance stable and reliable). (Support GSM Standard 2G Card only). - 【Wireless Remote Control】 You can remote control home sensors setting, easily to remote arm/disarm all sensors, or set up message and call real-time push notifications setting and view all sensors' status from APP. The app must be international mode. With Timer function, you can set automatic arm/disarm time according to your own routine time, avoiding repeated operation or miss arm/disarm. 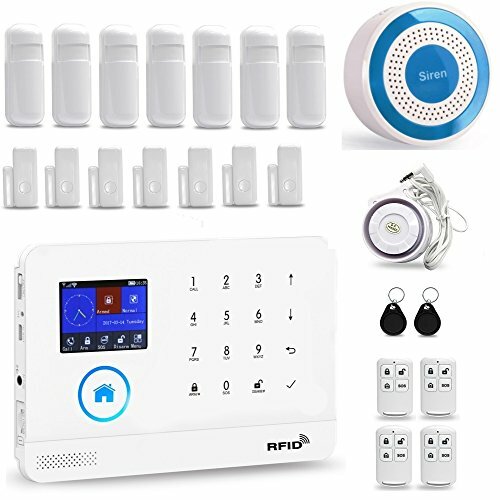 - 【Smart Alarm Kits】 This home security system complete with fully programmable alarm host and sensors. Alarm host designed with colorful 2.4 Inch TFT screen and touch panel, easily to watch and operate. Accessories include 1 x Alarm Host, 1 x Wired Siren, 1 x Wireless Siren, 7 x PIR Detectors, 7 x Door/Window Sensors, 4 x Remote Controller, 1 x USB Power Cable (NO Power Adapter), 1 x User Manual.